I pulled an overnight download session, and the Safari 4 disk image was ready and waiting in the morning. The PowerBook was due for a reboot anyway, so I did an OnyX maintenance swipe yesterday afternoon and then ran the installer, which informed me that I first needed to install the OS X Security Update 2009-001 on my OS X 10.5.6 system in order for it to proceed. Fortunately I had grabbed the Security Update last week when I was in range of a WiFi hotspot, so I had it on hand as well. The installer tandem was applied in sequence without any drama, and Safari 4 started up. It was a bit of an anticlimax to note that it looked pretty much like Safari 3, which is to say a bit uninspired and boring. 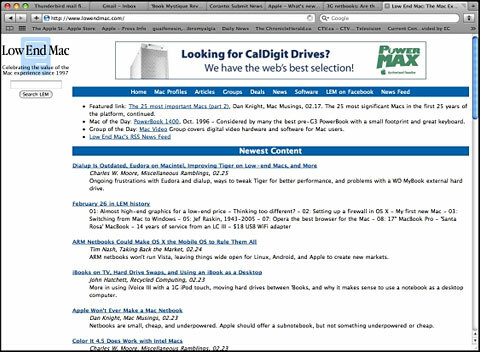 Apple's Safari engineers could take some aesthetics lessons from the Camino (or even Firefox), Opera, and iCab folks. However, I soon began to notice some changes. For one thing, Safari 4's tabs array has been moved to the very top of the browser window, where the largely wasted title bar space used to be, thus providing a bit more room for content. Safari 4 moves tabs to the very top of the browser window. Makes sense. Not really an Apple innovation, though. Opera had it way back when it was a quirky and interesting but not very good browser, and Google's Chrome (Windows only at this point and probably the inspiration here) has tabs on top as well. Ironically Opera, which is a superb browser these days, no longer has tabs on top. Go figure. I like the idea, as I detest scrolling, and working on laptops, especially widescreen laptops, vertical screen headroom always seems to be at a premium. Thumbs-up on the ascended tabs. Low End Mac as viewed with the Safari 4 Beta. I did get a bit of a shock when I noticed that the Stop Page Load button had gone missing. I couldn't find it in the Tool Bar customization palette either. Very strange, thought I. I absolutely could not survive without it, since I use many times a day (dialup again). However, a quick Google search revealed that the Stop Loading button has been integrated with the little activity spinny-wheel in the address field. Just click on the spinner to bring things to a halt. I actually like that idea too. What I don't like is that the blue progress bar in the address field is no longer with us, at least by default. I understand there is a way of reactivating it in Safari 4 using the Terminal, but I haven't found idiot-proof instructions yet. Apple's in-the-address-field progress bar motif has never been popular with me, but it's a whole lot better than no progress bar. This is a feature where iCab, Camino, and Firefox show the way to do it right. Opera's progress bar is pretty lame. but at least it has one. Another Safari 4 "innovation" cribbed from Opera is Top Sites, which provide an at-a-glance preview of your favorite websites when you open a new tab or browser window. Opera's Speed Dial feature predates Safari's Top Sites. 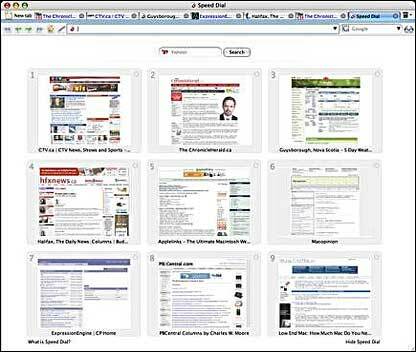 Opera has had the similar Speed Dial feature for several years now, but Safari 4 takes the basic idea and runs with it, not only creating thumbnail links for favorite sites, but tracking the sites you browse and ranking your favorites, presenting up to 24 thumbnails on a single page. 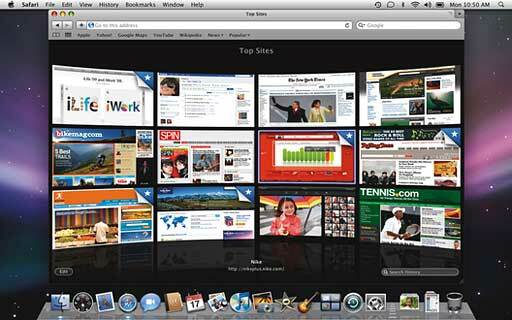 Safari's new Top Sites feature uses CoverFlow, looks nicer than Speed Dial. You can also customize the display by pinning a favorite site to a specific location in the grid, which locks it into position so you know where to find it every time you open Top Sites. Wonder which sites have changed since your last visit? Sites with a star in the upper-right corner have new content. A single click opens the page and updates its thumbnail. Whenever you want to return to your ever-evolving Top Sites page, just click the new Top Sites button in the bookmarks bar. Top Sites is also significantly more attractive - stunning really - compared with Speed Dial's looks. Top Sites showing a dozen favorites. Other new feartures include Cover Flow, to flip through web history or bookmarks; Full Page Zoom, which lets you take a closer look at any website without degrading the quality of the site's layout and text (Opera's implementation of this is slicker and more convenient); and built-in Web developer tools to debug, tweak, and optimize a website for peak performance and compatibility. Well, not over my dialup connection, where I would seat-of-the-pants rate Safari 4 behind Opera 9.x and Camino 1.6 in speed, although it is reasonably lively. This is still a beta, of course, with plenty of rough edges being reported on the forums, although I haven't encountered anything really frustrating yet. Will Safari 4 win me back to the orchard? Nope. I'm not getting any extra speed, and Opera and Camino look nicer and are nicer to use. Safari's Download Manager is especially lame compared with the excellent one in Opera, which is the state of the art in browser download managers by a wide margin over everything else. However, I'll probably stick with Safari 4 serving as a third- or fourth-string browser rather than running the helpfully provided uninstaller and reverting back to Safari 3. Safari 4 is a free public beta for both Mac OS X and Windows and is available immediately as a free download. Safari 4 for Mac OS X requires Mac OS X Leopard version 10.5.6 and Security Update 2009-001 or Mac OS X Tiger version 10.4.11, a minimum 256 MB of memory, and is designed to run on any Intel-based Mac or a Mac with a PowerPC G5, G4 or G3 processor and built-in FireWire. Safari 4 for Windows requires Windows XP SP2 or Windows Vista, a minimum 256 MB of memory and a system with at least a 500 MHz Intel Pentium processor.